We've just finalized our first major milestone in the development of a new tool to improve how the HOT community organizes field mapping. Field mapping requires tools to engage local communities and organize how local knowledge is collected and we've been working with Kartoza to build a tool for better field mapping. Our first version of a field mapping organizer is now ready and being tested. On Saturday at State of the Map 2017, Paul will share an update the progress and how the tool is being used in the HOT community, as well as the potential use for the wider OSM community. Below is a quick update on the key features we've focused on for this release. A significant focus for our first version has been on how to organize and monitor the data being collected after a remote campaign. 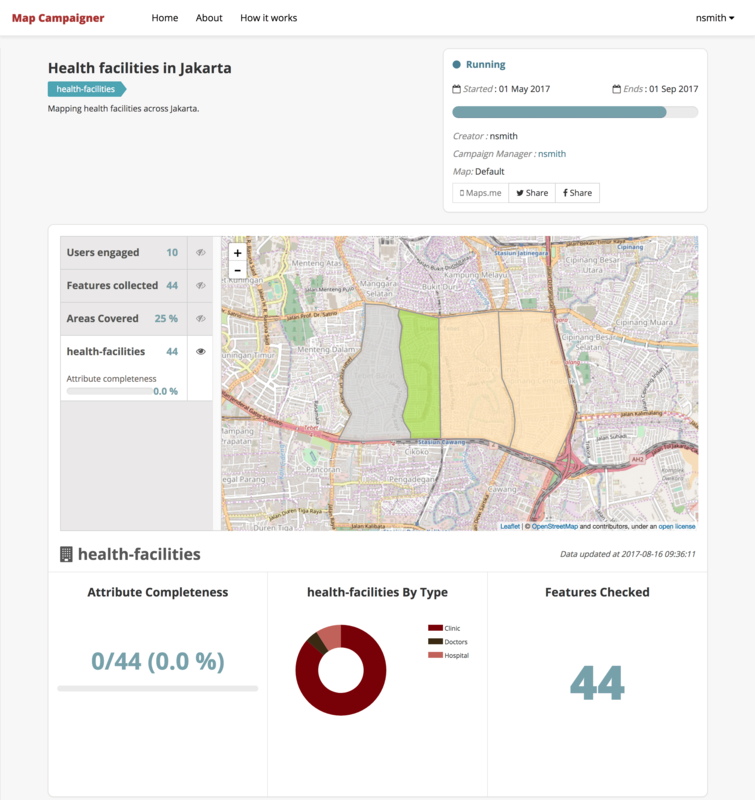 The application allows mapping managers or organizers create field mapping campaigns based on an area of interest, define the features and tags to be tracked, and monitor the quality and completeness of the data. 1. Splitting and assigning areas to teams or individuals. A key feature for distributing and organizing efficient mapping is enabling mapping organizers to divide areas of a community into sections, or tasks - similar to the Tasking Manager concept. Mapping organizers can assign areas and mark the progress of those areas. The campaign dashboard view shows an overview of the entire progress across an area. 2. Statistics on data quality and contributors. 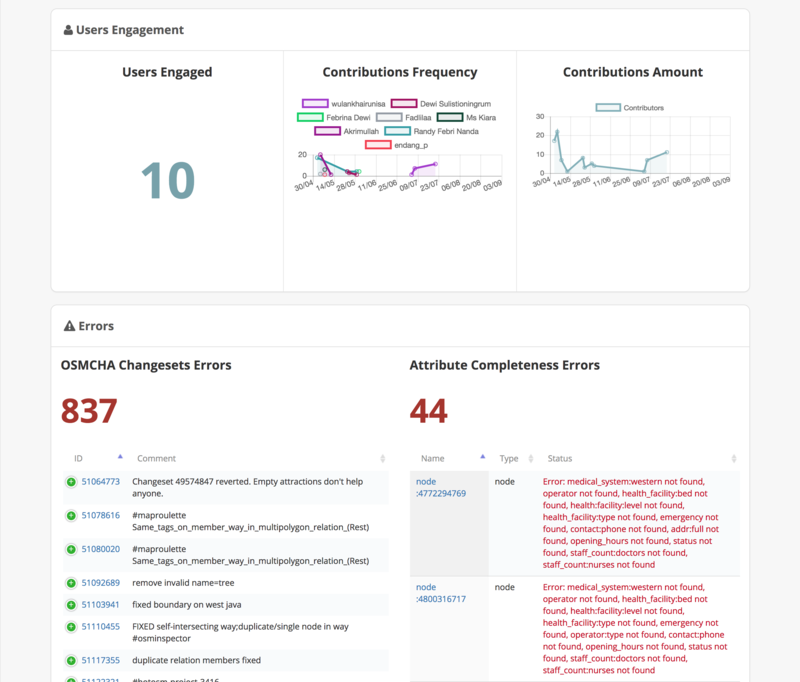 Each campaign dashboard page shows metrics for data quality and the users that engage in data collection. We've focused on one key measure of quality at the moment: completeness (based on a local data model). The application checks each feature collected for the correct number of OSM tags and displays the level of completeness for the entire campaign. 3. Errors and warning messages for extra quality checks. The application also checks the campaign area for other errors like capitalization and leverages Mapbox's OSMCHA service for other suspect changes. With the completion of this first release, we’ve moved into testing the app with several of our field teams in Istanbul, Kampala, Dar es Salaam, and Jakarta. Our testing is focused on identifying key points in our the process that are difficult to users as well as generating priorities for a final phase of development. On Friday, August 25 at 14:00 UTC we’ll have a community call to provide anyone interested a first look at the application and a discussion on our final phase of development. We’ll share the priorities that came out of the field testing and conduct a discussion around these priorities. Look for call-in details via the HOT mailing list and on Slack. Have questions? Join in the conversation on Slack or Github.